A disability is when someone has developmental, cognitive, mental, intellectual, physical or sensory impairment. As implied by the name, a hidden or invisible disability is the one that is not immediately noticeable. Some people may have an auditory or visual disability but they do not wear hearing aids or glasses, it may come across as normal people. In other words, when someone does not use any assistive device to tackle their disabilities, they are known to have an invisible disability. Let's find out more about some of the most common disabilities invisible to the naked eye. People behave respectfully when they know someone has a disability, but sometimes, people need special treatment because of their disabilities but do not get it since others cannot see it. People with invisible disabilities can qualify for disability benefits and need special attention too. Here are common conditions that may be causing people great pain. Also called Lyme borreliosis, Lyme disease is an infectious bacterial disease. Spread by ticks, it can cause chronic muscle pain and joint swelling. Severe fatigue is also a common sign of infection. Untreated, the symptoms can become worse, especially when the bacteria spread to the heart, brain, and joints. Paralysis in the muscles of the face is another common complication, but these symptoms may or may not be visible to others, and that is why it is considered an invisible disability. A chronic autoimmune disease, lupus can make you feel tired all the time. It attacks your immune system and makes it hyperactive. The immune system starts targeting normal, healthy tissue, which leads to symptoms such as swelling, inflammation, and damage to joints, kidneys, skin, blood and the heart. In some cases, you may experience irreversible organ damage; in fact, a large majority of people dies because of kidney failure. Due to its symptoms, it is also among the list of disabilities invisible to the naked eye. Unless someone tells you, you will not know that they are suffering from fibromyalgia. The patient experiences widespread pain and tenderness. The most common symptoms include fatigue, muscle pain, painful tender joints, and sleep problems. It is important to manage stress in your life because stressful events can trigger a fibromyalgia flare-up. Unless a person experiences an attack in front of you, you will not be able to tell that someone has epilepsy. This central nervous system disease is usually the result of head trauma and causes seizures. Certain brain conditions, such as strokes or a brain tumor may also cause epilepsy. The electrical activity increases manifold during a seizure and leads to a number of symptoms. This severe mood disorder can cause a number of physical symptoms as well. Some of the most common symptoms include back pain, headaches, and fatigue. Some people suffer from clinical depression while others have a depressive disorder with a seasonal pattern. Clinical depression is, in particular, a serious mood disorder that causes feelings of hopelessness, sadness, worthlessness, and helplessness. People experience other problems as well such as difficulty sleeping, little appetite, low-grade fatigue, and low self-esteem. Untreated, clinical depression can lead to risky behaviors such as alcohol addiction or drug addiction. This one among the disabilities invisible to the naked eye can cause patients to have suicidal thoughts. An inflammatory condition, Crohn's disease affects the intestines. The most common symptoms include diarrhea, abdominal pain, fever, vomiting, and more. Pain and cramping associated with Crohn's disease can be severe. With this inflammatory bowel disease, you will find it difficult to live a normal life, which is why it is considered a disability. It is hard for you to tell if a person is suffering from Asperger's syndrome because they usually have near-normal language skills and intelligence. The only issue is that they find it difficult and challenging to communicate and socialize with others. These children and adults usually exhibit repetitive behaviors and have a very limited range of interests. It is worth mentioning that while most experts believe that the traits of Asperger's syndrome persist as a child grows up, it is possible to notice a decrease in the severity of those symptoms. Just like epilepsy, it is hard to tell if anyone is suffering from asthma until they end up having an attack in front of you. 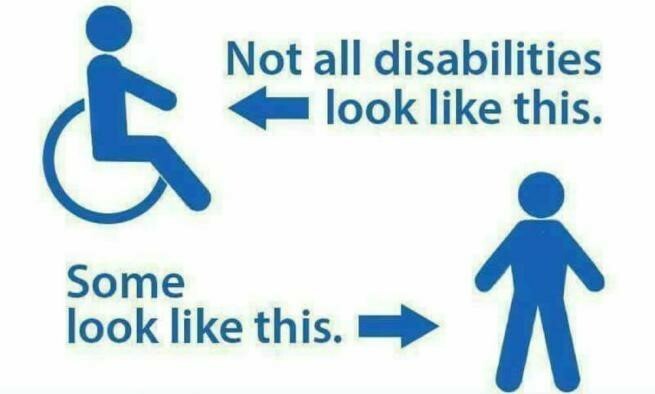 It is considered a disability because it affects a person's day-to-day life and they just cannot expose them to certain triggers present in the world around you. Asthma causes breathing difficulty due to your inflamed airways. This long-term inflammatory disease is characterized by recurring symptoms, such as episodes of coughing, wheezing, shortness of breath, and chest tightness. Asthmatics need to take special care because asthma triggers include substances and irritants that trigger allergies. Some of these triggers are dust mites, pollen, pet dander, mold spores, and particles of cockroach waste. Keep in mind that people with asthma may qualify for disability benefits depending on the severity of their condition. There’s more on the list of disabilities invisible to the naked eye but these are the most common ones.